Within this paper, a new generation of wheelchair systems is described. They are especially well suited for vocational rehabilitation and providing an opportunity of natural wheelchair control to people with severe physical or multiple handicap. The chairs are equipped with omnidirectional steering, novel sensorics for user's safety, and sophisticated navigation modules. A wide range of control devices can be used for wheelchair as well as environmental control. Semi-autonomous driving modes are facilitating difficult driving tasks. The use of powered wheelchairs is one of the great steps towards the integration of severely disabled people, enabling them self-controlled mobility without external help. However, many of them, especially those with restricted psycho-mental capabilities, are hardly able to operate conventional wheelchairs. There are two reasons why those systems cannot address these people: their limited mobility and restricted functionality. Normal domestic environments (e.g. bathrooms) are often complex structured and therefore require a high manoeuvrability. Because of their kinematic constraints, conventional wheelchairs are hardly suitable to move within packed rooms. An increase of the mobility can be reached by the use of omnidirectional driving concepts. In order to offer people with restricted capabilities a higher degree of independence, the wheelchair presented (figure 1) has been provided with an expanded functionality. That means beside the `normal' user-controlled movement by simply using a joystick, several additional modes of operation, which can be represented as layers within a hierarchy of functionality, are supplied to the user. For example, by applying basic sensor systems, collision avoidance functions support the user to generate safe movements. Proceeding within the hierarchy, an environment guided movement can be helpful when driving along a corridor or through a door. Special complex manoeuvres like play-back (re-driving a recorded path, e.g. in the bathroom) or back-tracing (inversion of the recent manoeuvres) ease the control of the wheelchair in specific situations. The user requirements analysis showed that it was necessary to get an individually adaptable aid with a flexible, configurable functionality for disabled people in order to avoid the building of a special wheelchair for each user. That means, besides the `normal' function of user-controlled movement several additional modes of operation should be available to the user. The functionality can be classified within a hierarchy, where its different layers are shown in figure 2. Layers 1 - 4 were implemented within the OMNI-project. The top layer 5 is part of current research work. The lowest layer is represented by the possibility to control the wheelchair by simply using a joystick. Proceeding within this hierarchy, the functionality of the wheelchair increases. In the next layer, basic sensor systems (e.g. ultrasonic and IR sensors) are integrated into the control system to support the user, for example in collision avoidance and in generating save movements. The next layer is built by an environment directed movement of the wheelchair (driving along a wall, driving through a door) up to full sensor guidance, e.g. the docking at a station. Special complex manoeuvres like play-back movement (re-driving a recorded path, e.g. in the bathroom) or back-tracing (inversion of the recent manoeuvres) up to an automated guided movement (using devices of the vocational environment, e.g. magnetic ferrite marker lane, IR-landmarks, etc.) represent the top of the hierarchy. Figure 2 reflects also the distribution of efforts between the user and the control system. As the wheelchair becomes more autonomous by using the higher-level control, the burden on the user becomes less. While the functionality increases, safety aspects become more important. In order to give an adjusted and assistive system to the individual, the functionality has to be easily adaptable to the specific disabilities and needs of the user, that means, the system has to realize a high flexibility to allow transitions between the different layers. Furthermore, this operation on different levels of autonomy ensures that the user never feels patronized by the system; and although much autonomous vehicle and robot technology is used in the system, it doesn't act totally autonomous because the user is always able to interrupt or modify ongoing actions. Construction and design of a wheelchair have to rely on the ergonomic requirements and specific needs of the users. Another important aspect that has to be considered is the safety of the wheelchair, which makes high demands on its construction and control. Therefore, international safety standards have to be gained to satisfy the requirements for a save driving. Furthermore, the manoeuvrability of the wheelchair is instrumental especially in vocational environments, thus, new driving concepts have to be taken into consideration. In addition, it is important that the wheelchair users are able to elevate themselves to such an extend, that their shoulders are in the same height (or close to it) as if they would stand on their feet. Obviously, this is mandatory for the wheelchair users who are working in environments (i.e. offices) equipped with cabinets and shelves for persons without handicap. Prior to the OMNI project, mobile robot systems with omnidirectional driving concepts have been built up and among other things, their suitability for the use in rehabilitation technology has been studied. As a result, a pre-prototype of a wheelchair equipped with four so-called Mecanum wheels has been developed, able to move with three degrees-of-freedom (DOF) in a plane, so that any combination of forward, sideways, and rotational movement is possible. The prototype wheelchair had demonstrated the increase of mobility that can be yield by the use of such omnidirectional driving concepts, which allow to move even within packed indoor environments because of a non-restricted positioning capability. 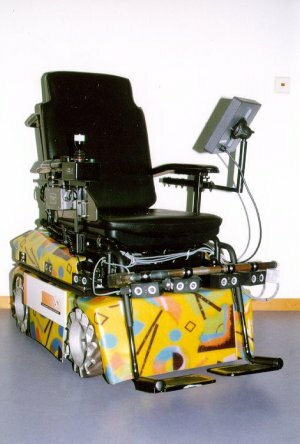 Experiences obtained with this pre-prototype were used to redesign the wheelchair construction to meet the requirements described above. Special attention was given to a compact design and to high reliability as well as to modifications to install extra equipment for safety requirements (e.g. bumper) and a sensor ring. The new elevating seat system enables the users to elevate themselves up to a height of 90 cm. It is mounted on the wheelchair platform in such a manner that the tipping of the wheelchair is excluded. Depending on the ergonomic requirements and special needs of the user, the seat is individually and easily adjustable. There is also the possibility to tilt the seat up to 30 degrees backwards for reaching an improved pressure distribution on the human body and therefore helping to reduce the danger of decubiti. The proximity sensor array is based on the concept of composite sensors. These are composed of an ultrasonic (US) range-finder and an infrared (IR) detector. This particular sensor arrangement is capable to achieve a perception of the explored objects which is not limited to their geometrical properties. The complementary features of reflecting behaviours for US waves and IR radiations enable to fuse together the information they supply. This enhances the robustness of obstacle avoidance. A Human-Machine-Interface (HMI) provides the user with the means to drive and operate the wheelchair and to have access to external systems such as workstations, communication devices and environmental control systems from a wide variety of input devices. The HMI displays the functionality options of the system (wheelchair and external systems) either textual or pictorial on a screen, activates system functions selected by the user via the input devices, and displays dynamic information from/about the system (like speed or battery power of the wheelchair). The standard input device for driving an omnidirectional wheelchair is a 3-dimensional joystick. However, the user tests have shown that not all persons are able to operate this kind of joystick. Therefore other devices (e.g. switches) can be connected to a standardized interface. To be effective in the workplace the user of the OMNI wheelchair has to be able to have access to the environment as well as being able to have effective control of the chair. The Control and Environment Interface provides a number of modules that allow commercially available devices to be used to control the chair and the environment, allowing simultaneous access to different external systems. The demand for a large functionality with high flexibility as described in the system requirements as well as the integration of the subsystems described above, leads to a modular structured control system, composed also of different smart units. Each unit is provided with local intelligence which enables a flexible reaction and increases the reliability because of a mutual verification of the transferred data. The different modules share an identical underlying structure. The main components of the module structure are the local knowledge base, the inference mechanism, the communication unit and the functional unit. The communication unit is responsible for the module interaction, which is based on a message-passing mechanism and combined with a fault tolerant module interprocessing. The module knowledge is represented in a hybrid knowledge base. The processing of the declarative and procedural knowledge by the inference mechanism runs through three phases: First, the matcher identifies all applicable rules, i.e. those whose conditions match the facts stored in the data base. From amongst the set of applicable rules, the selector determines within the second phase that rule, which should be executed by evaluating the priorities attached to them. Finally, the interpreter executes the conclusion of the selected rule. As bridge to the subsystems, the functional unit contains a set of functions, which operate the specific module hardware/software resources. The architecture of the overall control system consists therefore of different intelligent modules, which are able to organize their interaction by themselves. Because of the self-organizing feature of the module communication mechanism and the modular architecture, the system is open and its functionality can easily be expanded, so that the integration of high-level processing, such as task-oriented programming, path-planning etc., requires no system modification. The distributed intelligence allows the design of a fault tolerant system. That means, using the local knowledge base, the system is provided with the capability to continue the operation with reduced functionality in case of the absence of a module from the system. The presented control architecture makes it feasible to act on different levels of abstraction and to support the user according to his specific disabilities with several modes of operation, e.g. movement with sensorics, back-tracing, play-back. It also gives the possibility to integrate devices for the control and the communication with the vocational as well as with the domestic environment. A new generation of smart sensor-assisted wheelchair systems for the vocational rehabilitation of people with severe and multiple handicap has been presented, which has been developed and thoroughly tested with users in the OMNI-project, supported by the CEC-program TIDE. In this project, a major step towards the objective has been achieved by the omnidirectional mobility of the wheelchair. The control system is flexible configurable and allows a control of the wheelchair on different levels of abstraction according to the different users needs. This is supported by ultrasonic/infrared sensors and by a sensor-fusion for real-time obstacle avoidance and backtracing. A modular human-machine-interface, which is adaptable to meet the different user's abilities, provides an uniform control for wheelchair, communication, and environment. The above works formed part of the OMNI project which was supported by the CEC TIDE programme. This was a collaborative project undertaken by: CALL (Scotland), FernUniversitaet, PRT (Germany), FTB (Germany), Ortopedia (Germany), SM (Italy), SSSA (Italy).